Travelling through Vietnam was one of the most exhausting stints of backpacking I have done, but one of the most rewarding. It’s an incredibly beautiful country with such a rich history, but I seriously underestimated how huge the country is and quite how long it would take to travel between places. I spent almost every night on overnight buses or trains, just trying to grab a few hours sleep before exploring the next stop on my journey. 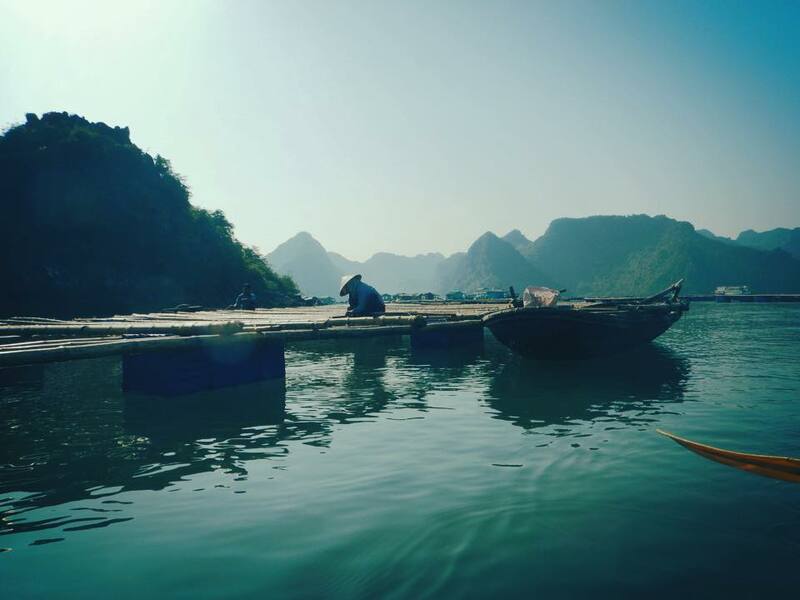 Read about how I managed to see Vietnam in 2 1/2 weeks. One of the truly amazing places I was lucky enough to visit, but sadly didn’t have time to write about in full at the time, was the breathtaking UNESCO World Heritage Site, Halong Bay. Including around 1,600 tiny islands and islets, with towering limestone cliffs scattered across this stunning seascape, it’s one of the places that remains etched on my memory. You know how some places just take your breath away, how some places are just so spectacular that you can’t believe you were one of the lucky ones who got to experience it first hand? 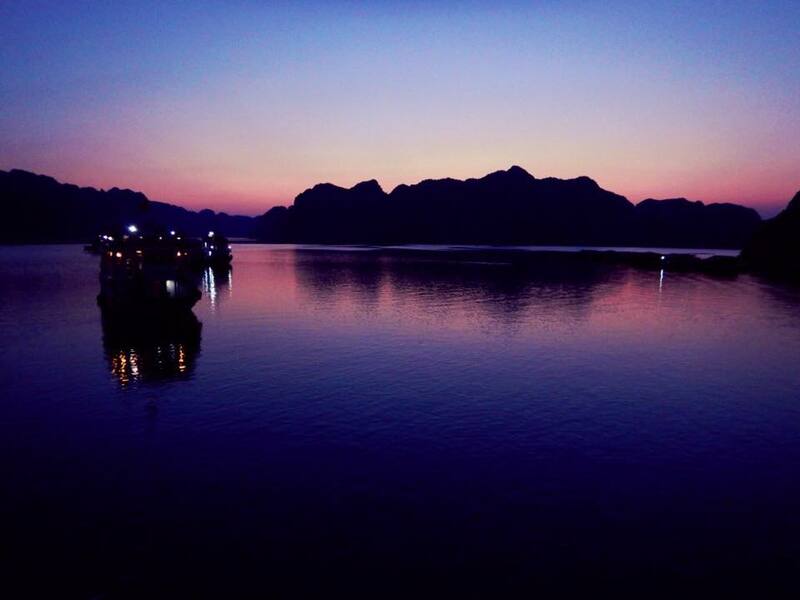 Well Halong Bay was like that for me, I got to experience it with an amazing group of people from all over the world from the comfort of our own little cruise. I’ll be honest and say that the name of my cruise company has slipped my memory now, but there are endless numbers of companies to choose from. From the ultra luxurious to the backpacker party boats, there’s something for everyone. I was a bit bored of backpacker partying, so I plumped for a mid-level boat with all the comforts I needed and none of the rabble. I was excited at the thought of witnessing this beautiful place with a group of adults who just wanted to appreciate natural beauty and relax rather than chugging beer. I wasn’t disappointed, the boat was amazing, so well-equipped and comfortable for the cheap price. I shared a cabin with one other woman and we had our own en suite bathroom, it was a perfect size for the two of us and there was lots of space up on the main deck and in the cabin for us to spend the rest of the days. The inside cabin came with a well-stocked, although expensive, bar, dining tables and even a small club set-up at one end for entertainment. Up on deck was our favourite area, lots of space for sunbathing, taking in the view and relaxing. With so many different types of cruises, come just as many options for entertainment during the trip. 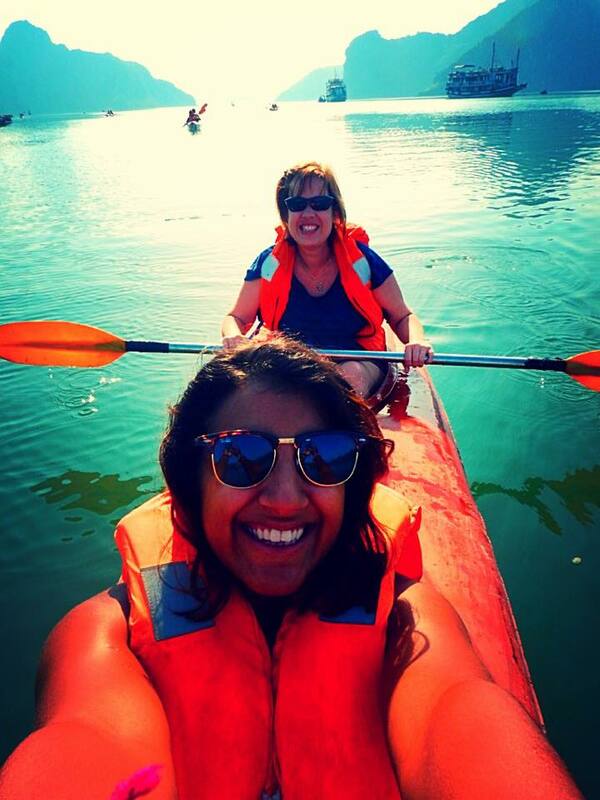 I chose a two day, one night trip around the bay that took us on a cruise all around the stunning islands. The first day we spent the afternoon exploring some of the most incredible caves I have seen yet, Surprise Cave, in Bo Hon Island, is absolutely huge despite seeming quite small at first glace, as you step further into it’s hidden depths you are met with an enormous cave system full of twists and turns. 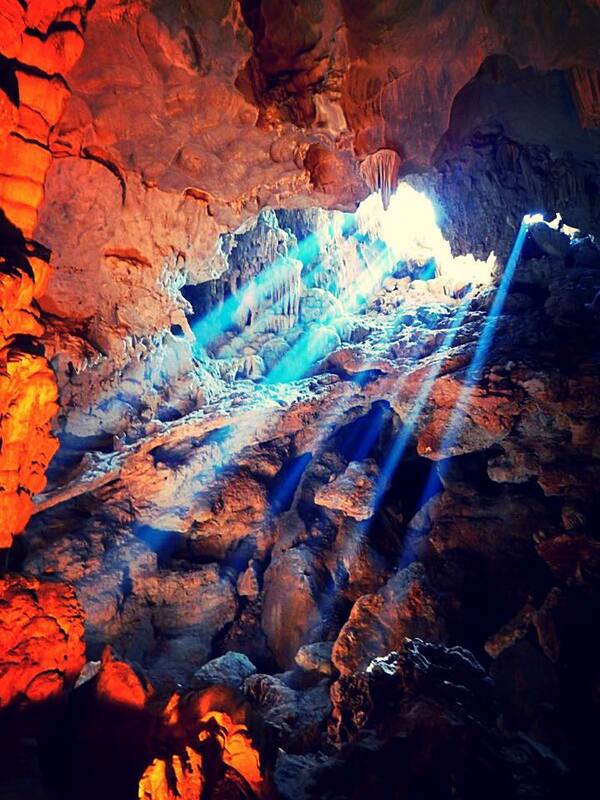 Our guide took us on a walk around the caves, pointing out strange rock formations that have been given nicknames over the years as light poured in through tiny cracks and crevices in the rock. It was an amazing sight and a real contrast to the stunning openness of the rest of the bay. You’re really struck by the vastness of the landscape when you come out of the caves to find a panoramic view across Halong Bay. After we made our way back to the boat, we were treated to a Vietnamese cooking class where we made our own fresh and friend spring rolls ready for dinner. It was messy, good fun as we watched the demonstration and then tried our hand at making our own rolls, with both vegetarian and meat options available. That night we enjoyed a feast of delicious Vietnamese dishes as a group, it was lovely to sit around with so many different types of travelers. Some were couples on a two-week holiday, others were backpackers who were part-way through a year-long trip, others were travelling the length of the country. It’s easy to get stuck around backpackers when you stay in hostels, it can be refreshing to meet different types of travellers and hear about their experiences as well. 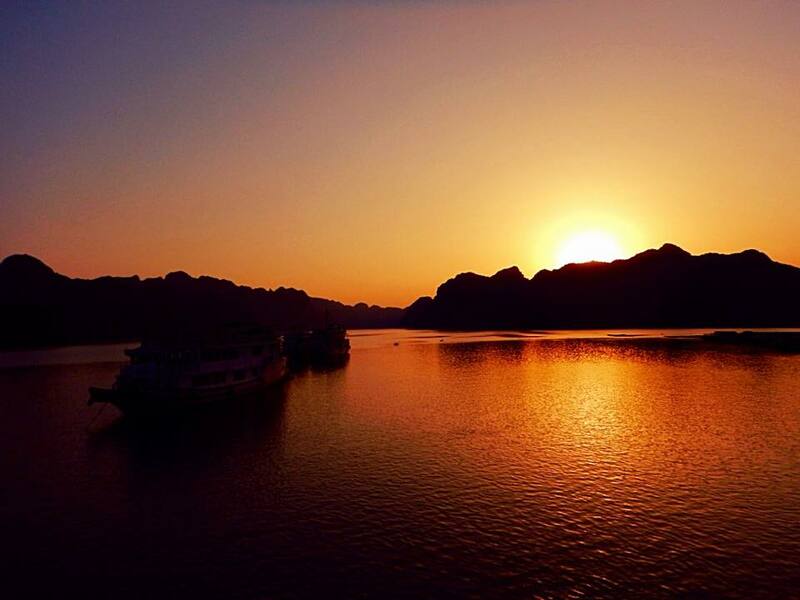 The evening was spent drinking beers and watching the sunset from the top of the boat – a perfect end to our first day in Halong Bay. I woke bright and early the next day and got to see the sun come up over the Bay, is was so beautiful and peaceful. No-one apart from the workers and fishermen were up yet and I felt like I had the whole Bay to myself – that blissful moment of pure stillness is how I remember Halong Bay. Then it was wake-up time for everyone else because we were all going kayaking around the Bay, I shared a kayak with one of the other ladies on the boat and we had a hilarious time trying to manoeuvre our boat around the islets. 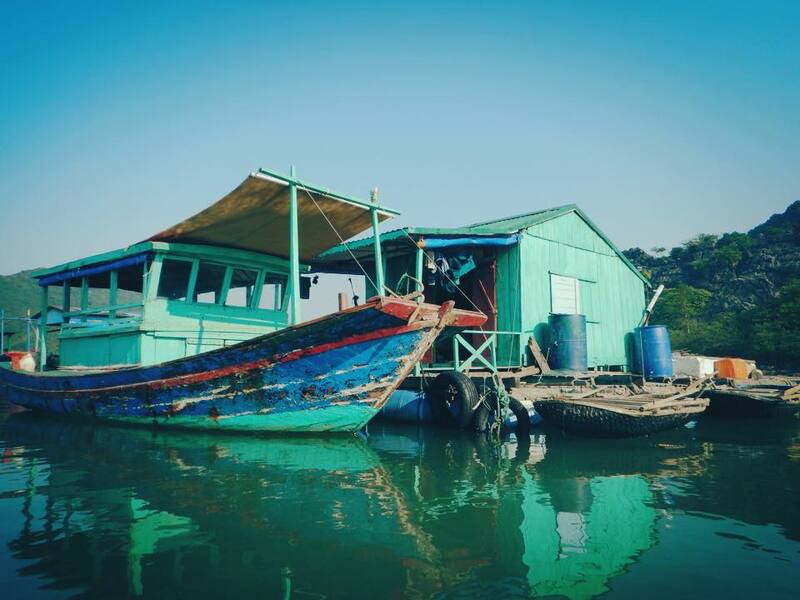 It was lovely to spend some time out on the water and it was amazing to explore the floating market and village near where we docked – it’s just amazing to witness how these people live out on the water in their little huts. Such a simple lifestyle in such a stunning setting, I felt so lucky to experience just a taste of their lives as we waved at them from the kayak. Once we rowed our way around the islands, we couldn’t resist jumping into the clear, fresh waters for a swim under the morning sun, it was a shock to the system but the perfect way to start the day. After breakfast, we took a slow cruise back to the harbour, ending our trip with a smile. It was such a well-needed break from the hustle and bustle of Hanoi, and the stresses of travelling after a rocky start in the country. Getting out to sea was a perfect way to show you why you were travelling, why you had ventured across thousands of miles to do this – for these incredible natural sights, for the people you meet and for the amazing experiences you have along the way. 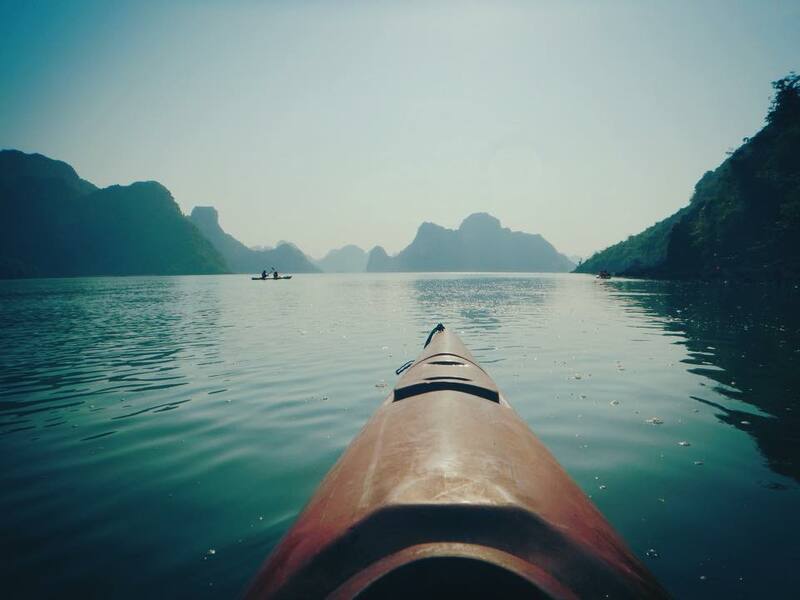 Whatever you do, don’t miss a visit to Halong Bay – you won’t experience anything like it anywhere else. 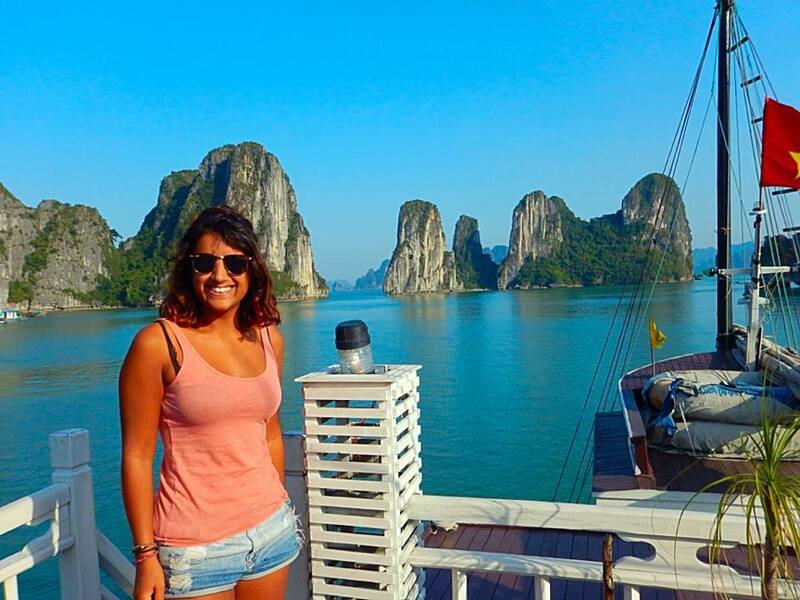 Read more about my experiences in Halong Bay here. 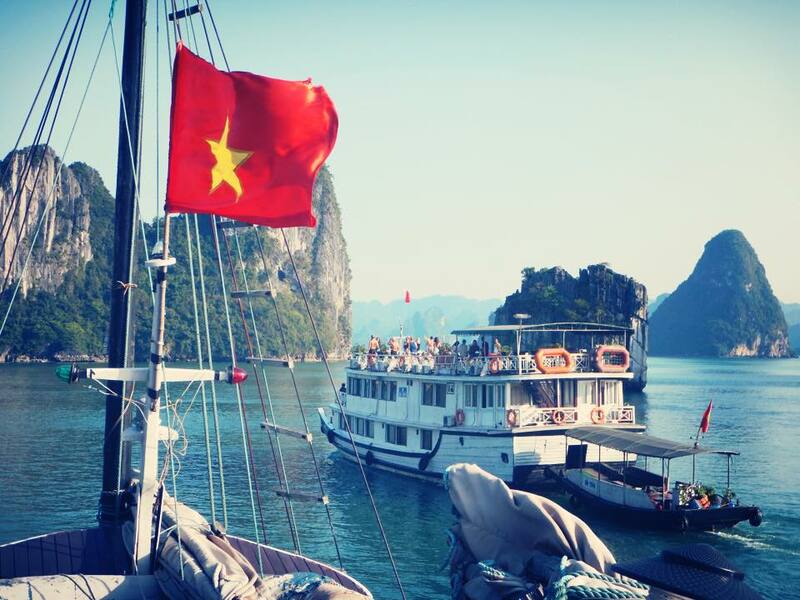 Have you been to Halong Bay – tell me about your experience. Can you recommend any cruise companies? 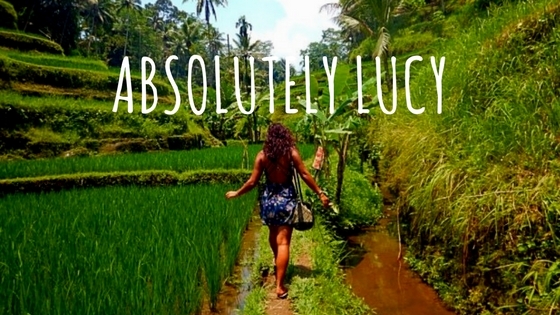 Have you been to a bucket list location?